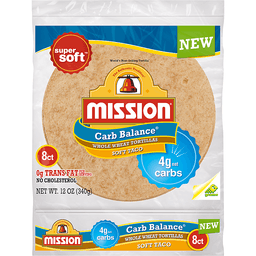 Mission® Carb Balance® Soft Taco Whole Wheat Tortillas. Super Soft™. New. 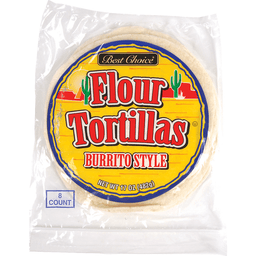 World's Best-Selling Tortilla®. The Authentic Tradition®. 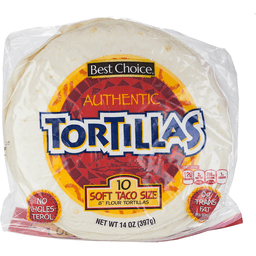 0g trans fat per serving. No cholesterol. 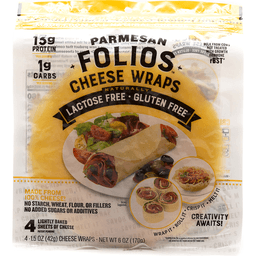 4g net carbs. Gruma®. Net wt. 12 oz (340g). Partially produced with genetic engineering. 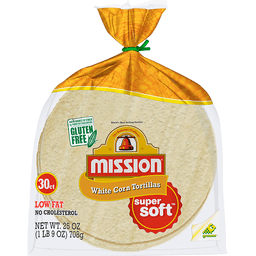 Mission® Carb Balance® tortillas are an excellent source of fiber and contain 3g of total fat per serving. 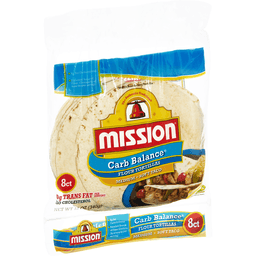 Enjoy the freshly baked taste of Mission® Carb Balance® tortillas. 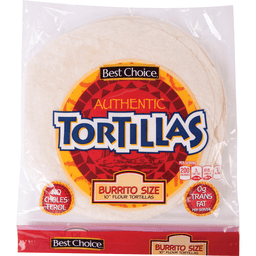 Soft and delicious, our tortillas are great for all kinds of meals and snacks, from fajitas to wraps! 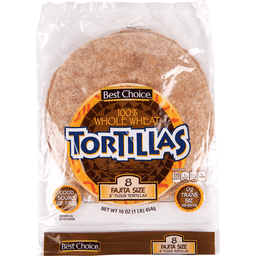 Look for other nutritious and delicious Mission® tortilla products like 100% whole wheat and multi-grain tortillas. To calculate net effective carbs: When counting carbs you can deduct the grams of dietary fiber from the total carbohydrate grams to get the net carb count. 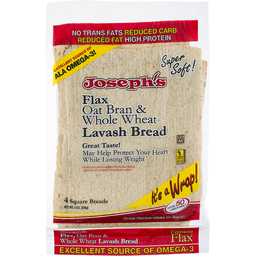 Example: 19g total carbohydrates - 15g dietary fiber = 4g net effective carbs. The net effective carbs are the carbohydrates that affect blood sugar. Questions or comments 1-800-600-8226 weekdays 9:00AM to 5:00PM Central Time. 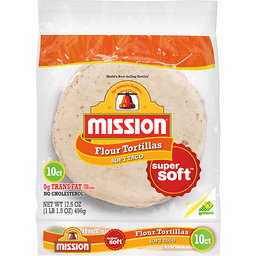 For great recipe ideas, questions or comments, visit: missionmenus.com. 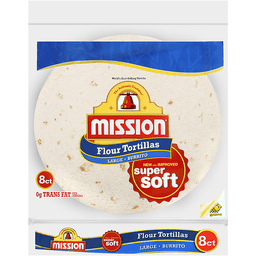 Mission®, The Authentic Tradition®, World's Best-Selling Tortilla®, and Carb Balance® are registered trademarks of Gruma Corporation. Gruma® is a registered trademark of Gruma S.A.B. de C.V. ©2015 Gruma Corporation. Always keep 'em 'round. Stays rolled! Soft and tender. 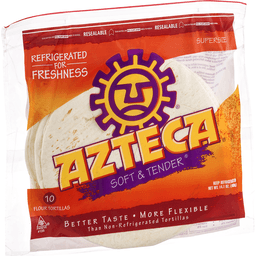 Visit our website at: www.aztecafoods.com. Product of USA. Bake & Fill Crispy Salad Shells. Includes 4 salad shells and formers. 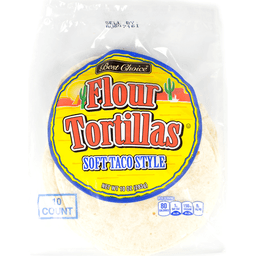 Unique from Azteca, Salad Shells that you bake up fresh at home. In minutes, you'll enjoy crispy Salad Shells perfect for filling with one of the recipes below or your own favorite salad recipe. Create a tasty new combination by serving hearty chili, ice cream or a vegetable dip in these attractive bowls. 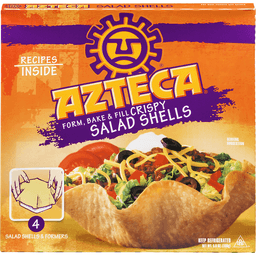 You'll add flavor, fun and freshness to your meals when you serve Azteca Salad Shells! 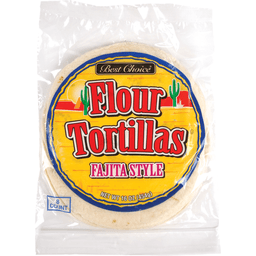 Product of U.S.A.
World's best-selling tortilla. Good source of fiber. Naturally low fat food. The authentic tradition. Improved. Super soft. 0 g trans fat per serving. No cholesterol. 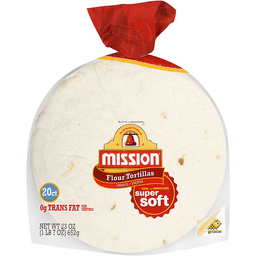 Enjoy the freshly baked taste of Mission tortillas. 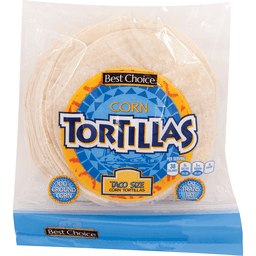 Soft and delicious, our tortillas serve up the authentic taste of Mexico because they are made with the highest quality corn masa flour. 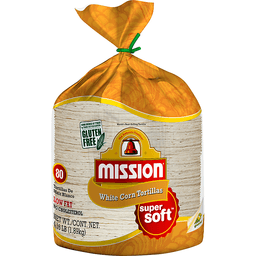 For great recipe ideas, questions & comments, visit: missionmenus.com. Gluten free.